Preaching should be done for the converted, not for those that will never be converted. When I write about the environment I think it is most useful for those that think that the prevention of environmental degradation and rapid global warming is the most important It is preaching to the converted, but, although I be be thought arrogant, so the converted generally do not understand their own religion, so environmentalists do not generally understand climate change. When humans settle in a place they have to adapt to its geography and its climate. Often this happens automatically, by default so as to speak. The plants and animals in the places when humans have spilled into have adapted over the millennia to the soils and weather of those places, so it is often a question of humans exploiting what already exists and if that is not enough to secure a good life, to improve what can be got from the land. When humans settled the Southern Pacific Ocean of Polynesia, they generally found an equable climate; they did not need to protect themselves from the weather. The Polynesians found abundance of fruit – usually bread fruit, which formed their staple diet, and along with bananas. The Polynesians adapted to their environment, which was largely conditioned by an equable and predictable climate. There was sunshine, but it was not too hot, there was rainfall but there was not too much of it, there were fertile lands that grew fruit trees that hardly needed tendering and seas full of fish. Tahiti and the Marquesas were settled by Polynesians where they lived a good and simple life. They did not need to do more than pull the fruit from the tree and cook it. They quickly built simple huts sufficient to protect them from warm tropical rain, and outside of the seas, there were few dangerous animals and no predators until the so called civilised world caught up with them. Accounts of the Polynesians show that they had an easy life on thousands of islands in the Pacific Ocean and it seems when population increase threatened a simple life the surplus population just sailed away to found new lives on previously uninhabited islands. Eventually a group of brave Polynesians reached Easter Island in the South Pacific which is the place on earth that is more remote than anywhere else. They must have found it a place overflowing with milk and honey, free from predators and diseases, with plenty of resources. There were many trees and the sea was full of fish. I imagine that life on Easter Island was so easy that the Polynesian inhabitants had plenty of time on their hands. There was, at least in the beginning, no threats of invasion and with time to spare they did what humanity usually does when there are excess resources and the rulers have more wealth than they can usefully spend – they embarked on big building projects. On Easter Island these projects comprised of building large stone platforms (Ahu) and erecting on them large statues (Moi), usually at places where there was fresh water close to the sea and where there are now some signs of human settlement. It seems that in order to build and transport these statutes from the quarry to the seaside they started using the trees, cutting them down until there were none left. They also overfished the island seas and their empire declined and fell, until it was given a nearly fatal coup de grace by “civilised” humanity arriving in large sailing ships from Europe and South America bringing such splendid trappings of civilisation as smallpox, syphilis and slavery. It seems that at the height of the Rapa Nui civilisation (Rap Nui is what the Easter Islanders call themselves and their Island) there were ten thousand inhabitants who built nearly a thousand statues. As the trees were cut down and the seas over fished and the fruits became less abundant so the inhabitants fought amongst themselves and overturned the statutes that they had built. Rapa Nui seems to hold an important lesson to us; nothing lasts forever and that includes power, prosperity and well being. These are benefits that we can too easily spoil, and have done so, not just on Rapa Nui but at many places throughout recorded history. There are now around 3000 Rap Nui who live on the Island and another 3000 people from Chile (to which Easter Island belongs) and from many other parts of the world. Today trees that have been replanted have grown, and parts of the Island are farmed, and Easter Island can sustain a reasonable quality of life for its inhabitants, helped by a modest tourist trade of curious people who have come to see the statues and attempt to work out their meaning. 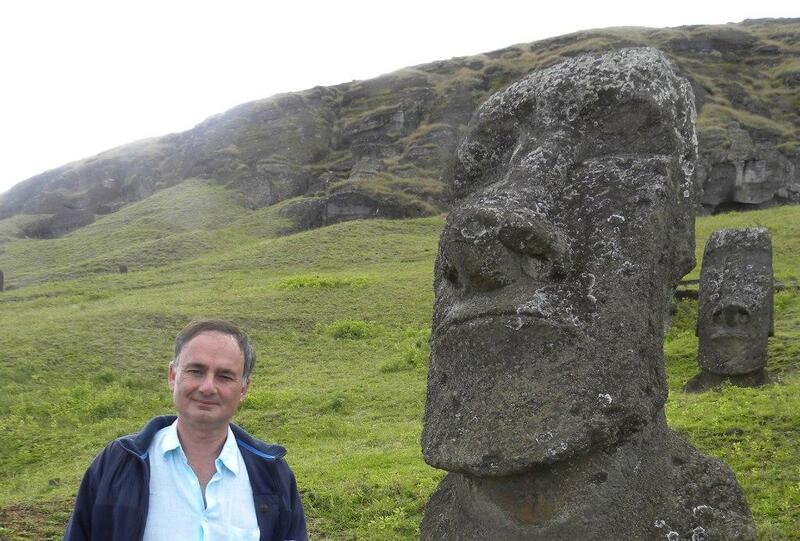 As impressive as the statues are, the real meaning of Easter Island lies in the environmental degradation wreaked upon it by humanity, which ultimately devastated humanity living there.